[The dismissive review in italics immediately below the revised version was written in haste and without any research. 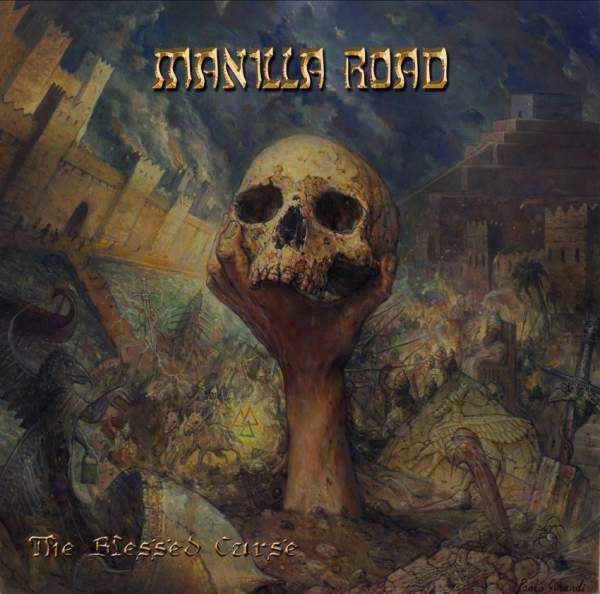 The latest Manilla Road is a two-disc compilation, the first part entitled The Blessed Curse consisting of heavy metal in the band’s patented style. The second disc called After The Muse is Mark Shelton on solo acoustic guitar, caught in a whimsical mood. The previous review has been included only to impress that an opinion on somebody’s hard work should never be written in haste. Speech is different and more spontaneous and prone to emotional outbursts, but there is no excuse to not pause before hitting post. Manilla Road‘s music since Out Of The Abyss and carrying on through and post the Atlantis Rising reformation has consisted of stretched out, larger-than-life musical themes with a distinctly more vicious edge to the metallic parts than that found on the band’s more renowned 80s work. Keeping in line with their trenchant history, Manilla Road have run counter to expectations, releasing album after album of meandering material that pays no heed to anybody other than the band’s individual muses. A certain predictability, no doubt, has crept into the band’s chord progressions, making more than a few songs from the last ten years fairly interchangeable. Hellroadie’s doppelganger voice, under Mark Shelton’s orders or otherwise, isn’t much for lending memorable flourishes to the songs, a cherished aspect from yesteryear that has been sorely missing of late. It’s almost as if Shelton has consciously renounced the catchier leanings of his younger years in chase of some greater truth. Suiting The Blessed Curse‘s Sumerian lyrical imagery, Shelton works in a variety of exotic overturess into his always-trustworthy, free-flowing guitar style. Riffs are still firmly anchored in the new millenial template, meaning they serve to enhance an ongoing atmosphere rather than work as stand-alone pieces, but there is more vitality on display here than observed on the previous two albums. Breaks into acoustic guitar sections are not uncommon; there is a progressive tint to The Blessed Curse but its progressiveness is not of intricate individual elements or convoluted structure, but rather that of a self-assured river flowing with perfect equanimity along the banks of an ancient city. Listeners are advised to hear The Blessed Curse part of the release before playing After The Muse. In such order, and as obviously designed by the band, adrenaline levels are set appropriately, and the listener knows that what follows will inevitably be a comedown but not an unexpected one. After The Muse is the broken voice of Mark Shelton pondering, over the gentle strains of his guitar, on the meaning of life and music, and whether the two are synonym for the same thing. Dreamlike and gloriously anachronistic, this collection of songs flies in the face of all contemporary logic, existing in its own little pocket of the universe as expression of its indomitable creator. The older version of the review that follows will indeed hint at the misgivings that many first-time listeners, trigger-happy or otherwise, are bound to have with respect to this album. The Blessed Curse/After The Muse holds no claim to reinvention; this is an old music made by an old band enamored with the dawn of history as filtered through the pulp of Robert E. Howard. Maybe that’s all the justification one needs to give it a second chance. The Blessed Curse sees Manilla Road returning to their roots in 70s pap and releasing an album full of AOR-friendly ballads. Mark Shelton on at least one song experiments with scales other than his beloved minor pentatonic but otherwise seems resigned to croon away to a pensioned dotage. Hellroadie’s involvement as ever is a honorable and sentimental but also contentious issue, chiefly because he doesn’t have the dynamics of other more natural singers. The drying up of memorable riffs and predictable vocal patterns has rendered a sameness to a lot of the band’s music over the last decade but never as pronounced as on The Blessed Curse. This ought to be the band’s final bow but whether it is so remains to be seen in light of the band’s late-dawning renown. To call this a sell-out would be disingenuous because this certainly isn’t anything the modern metalhead wants to hear and as such consistent with the band’s fiercely independent and slightly eccentric trajectory for over thirty-five years. There is a minstrelsy vibe to be found here but, unfortunately, also one of a bunch of songs thrown together while doodling listlessly on the tour bus. Shelton, as good as he has been within his niche, is not the most versatile of guitar players, and there isn’t enough meat on his acoustic musings to warrant their taking up nearly 70% of album time. Worse yet, there’s a consistently bright tone to the chords he chooses to employ, making the album an overly saccharine, and soporific, glop that wears on the senses long before it nears the end. One can say that Mark Shelton has earned the right to go out on his own terms. There is nothing insincere to be found here, just an overwhelming ennui that at first befuddles and then saddens. The Blessed Curse has more than a little of the dog on its last legs about it, mangy and nearly blind but still loyal. The question is, do we have the heart to put it down? This entry was posted in Heavy Metal and tagged After The Muse, heavy metal, manilla road, mark shelton, The Blessed Curse. Bookmark the permalink. not a particularly huge fan of the band and on hearing this a few times now i’m more in agreement with your original review.